Veterans have sacrificed so much for their country. They may have spent time away from their families, engaged in armed combat situations, received injuries and fulfilled countless other duties in exchange for keeping their home safe. They deserve to have something given back to them for all of their service. This is why things like the GI Bill and benefits from the Department of Veterans Affairs exist. What you may not know is that veterans are entitled to certain unique financial benefits, the likes of which that can save plenty of money. Let’s explore some of those lesser known benefits. While most people understand that the GI Bill offers ways for veterans to receive a college-level education, many are not aware that it affords credits for certification programs. This can help you save money, especially when you decide to change career paths. You can learn skills for a new job that do not require additional college learning, which in turn can both open new opportunities and bring a new way of earning income without relocating yourself. The Volunteer Income Tax Assistance offices on military bases allow for veterans to have their taxes prepared for free. This service can save a large amount of money in terms of preparing taxes, and, given the unique financial situations veterans often encounter, can help reduce future expenses by ensuring your taxes are prepared properly. Veterans are unique from the average civilian. Roughly 79 percent of veterans own their homes, while just about 63 percent of non-veterans own theirs. The VA loan is hailed as the reason for this. Not only does it offer better rates, but it also has more lenient debt-to-income ratio and credit criteria. This means aiming for a VA loan can save you money, especially if you are in a relatively uneasy financial situation. Mann Mortgage and similar companies can help veterans find affordable VA loans. This helps to ensure that you can save even more money while working towards the eventual ownership of your home. 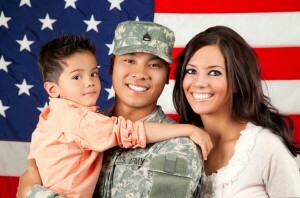 Several financial institutions offer bank accounts designed for active personnel and veterans. These accounts typically offer higher interest rates, lower fees, and programs designed to help with long-term savings. Some institutions may even offer accounts that make acquiring small loans possible. This can be particularly helpful when you need an extra bit of cash to avoid large fees, but you do not have the credit or built-up capital to make conventional loans possible. Veterans have numerous benefits available to them. These benefits can give back to you by helping you reduce your expenses, avoid fees, acquire the home of your dreams for your family, and eliminate potential financial pitfalls in the future. By taking advantage of these cost-saving benefits, you may be able to have your country repay you for your service by saving serious cash. Anica Oaks is a Freelance writer and web enthusiast. Read some of her published work on her Google+ page.